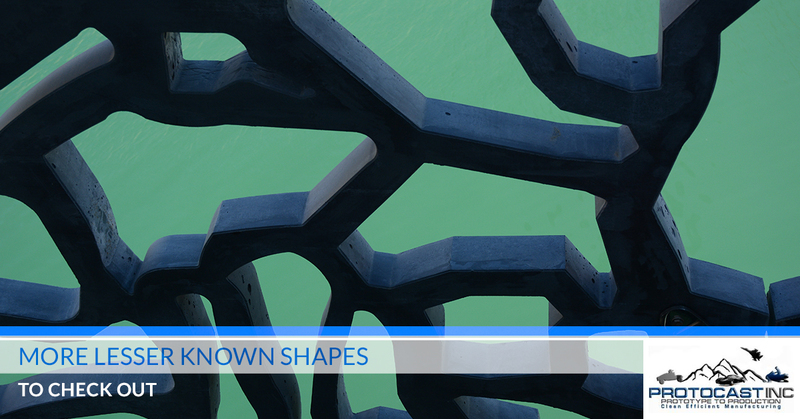 If you didn’t check out our previous post about irregular and uncommon shapes, you might be thinking, “A blog about shapes? What am I, a preschooler?” Without additional context, that is a fair assumption, dear reader. However, the reason we’re continuing to cover odd shapes is not only because they’re interesting (we’re engineers and math is fun, give us a break! ), but because they’re representative of what we do here at our Denver machine shop. Here at Protocast Inc., we’re able to create very precise parts based on whatever your production needs are. From the most common to the most obscure shapes imaginable, our aluminum foundry in Denver can take care of your business! So, to continue our previous post about not-so-common shapes, our aluminum foundry in Denver is going to cover some more of these in today’s blog post. As always, if you’re wondering how we can benefit your business and your production needs, feel free to get in touch with Protocast Inc. today! Or, if you’d like, visit here to learn more about what we do and why we do it. Wait, isn’t a torus really called a donut shape? Well, that’s what automatically comes to mind for most people when they see the torus shape. Of course, if one were to glaze and put sprinkles on a donut, we’re sure that it would be delicious. A lifebuoy is another great example of a fairly common torus-shaped object. Far from your ordinary triangle, this curved triangle is commonly seen as a guitar pick or even the shape of the Lamborghini logo (granted, that one is a bit of a stretch). The reuleaux triangle is a shape formed from the intersection of three circular disks, looking something like this. This shape is particularly interesting because people have constructed bike wheels in the shape of reuleaux triangles – wouldn’t the ride on the bike be choppy and inconsistent, unlike that of normal, circular wheels and tires? You’d think so, but physics works in mysterious ways. Check out a reuleaux bicycle (more like a tricycle at that point!) in action by visiting here. No, we didn’t mean “hyperbole” – we really did mean to say “hyperboloid.” Having nothing to do with intentional exaggeration, hyperboloids are interesting 3D shapes. Resembling that of an hourglass or a squashed cylinder, hyperboloids are used in cooling towers to improve cooling efficiency and upward convective airflow. Originally discovered by Greek philosopher Apollonius, the Apollonian Gasket is comprised of one giant circle with a series of increasingly smaller circles filling the open space. More like a multi-shape, the Apollonian Gasket tends to remind people of the Rorschach Test. Before you send your part designs into full production mode, create a prototype with us first! From sand casting to aluminum prototype casting and other types of rapid investment casting, Protocast Inc. is the preferred machine shop in Denver. Get started today!